Click here to view a slide show of the old and revitalized Joslyn Castle. Created in 1996 by the University of Nebraska College of Architecture, the Joslyn Institute for Sustainable Communities focuses on the built environment to promote sustainable development. Today, the Joslyn Institute (JISC) works independently from the University in its advocacy and modeling of sustainable design and development. In its early years, the Joslyn Institute was housed in the 1902 former home of George and Sarah Joslyn, a prominent family in the history of Omaha. The buildings and grounds were entered into the National Register of Historic Places by the National Trust for Historic Preservation, and the Joslyn Institute was charged by the State of Nebraska with managing and preserving the estate. 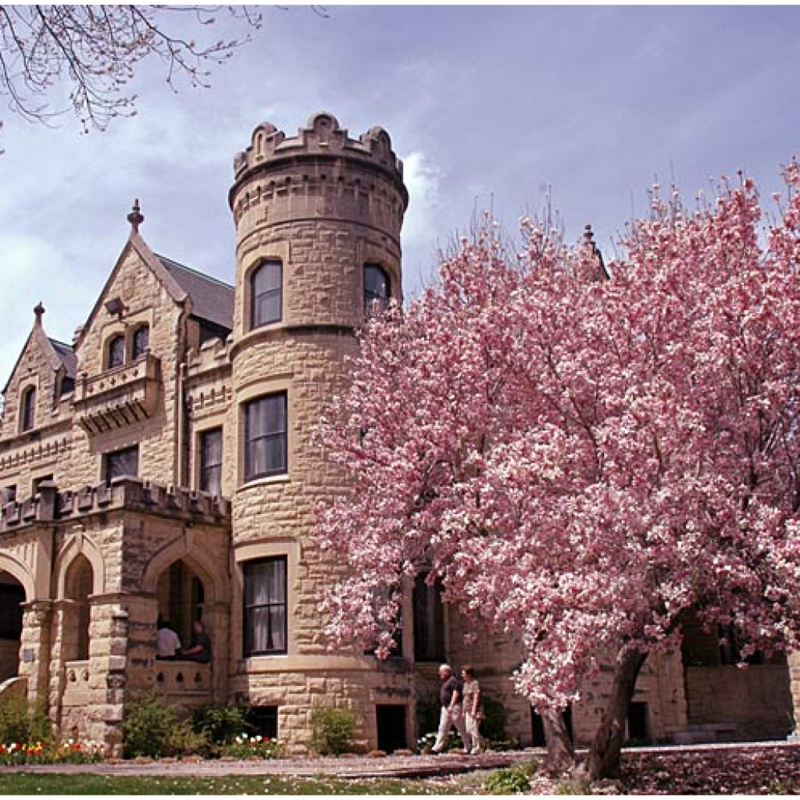 The castle and grounds provided an ideal setting for the Institute’s educational programs and preservation efforts. An early effort of JCI, following its founding in 1996, was to oversee the preparation of a Historic Structures Report on the history, conditions, and future uses of the buildings and grounds of the five-acre estate in the heart of Omaha. With the Historical Structures Report serving as its guide, the Friends of Joslyn Castle commissioned nationally renowned Evergreene Painting Studios to undertake the restoration of the interior of the Morning Room to celebrate the Castle’s 100th anniversary. Evergreene’s Paul Hotchkiss, who also led the restoration of St. Cecilia’s Cathedral and the Kansas State Capitol Building, conducted the initial site research study in the castle’s morning room. Through a series of “exposure windows” located throughout the room, a delicate layer by layer of paint removal revealed a number of unknown finishes. Between the pink crown molding and the pink picture rail, a beautiful laurel leaf border was discovered. Located under the picture rail, at each wall corner and above the wainscoting, is a beautiful handstenciled aluminum-leaf pattern of a Mackintosh type geometric pattern, which created a frame at the perimeter of each wall. This pattern is quite similar to the stencil located on the ceiling canvas in George’s room on the second floor. The sconces were cleaned and refurbishes back to their original opulence. The original chandelier was lost, but a period reproduction was put in its place. This project was the beginning of an ongoing process to returning the Joslyn Castle to its original state. Historic Fabric Assessment including an architectural description, evaluation of historic integrity, and evolution of spaces and representative photo documentation. Physical Condition Assessment including all accessible spaces, systems and component, finishes and fabric to determine current state of repair. Programming and Occupancy Evaluation to review current and anticipated occupancy and use plan and determination of planning and design criteria and restraints. Planning and Design occupancy models to be developed. The HSR report was used in conjunction with the Cultural Landscape Report for the Master Plan which defines levels of treatment for restoration and fundraising efforts. The HSR team included Jerry Berggren and Jennifer Hoenbrink for the Lincoln firm of Berggren and Woll as the project coordinators, Bryan Zimmer, Friends of Joslyn Castle President, the Jolsyn Castle Institute Structures Committees and other volunteer professional architects and engineers. In 1997 a team of professionals from the Omaha Landscape Architecture firm, Big Muddy, conducted an extensive research project to reveal the original landscape of the Joslyn Castle grounds. From this study the Cultural Landscape Report was developed. The Cultural Landscape Report details original structures, paths, ponds and plant species on the estate The Joslyn Castle Estate grounds have subsequently been designated a “landmark affiliate site” of the Nebraska Statewide Arboretum.